Anupama Shenoy to minister Parameshwar Naik: I have quit, when will you? 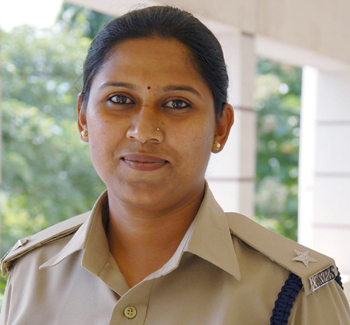 Bengaluru, June 07, 2016: Anupama Shenoy, former deputy superintendent of police, Kudligi who is on a warfront – after suddenly resigning from her position – is now training her guns on district in-charge minister and Labour minister PT Parameshwar Naik. On Tuesday, she wrote on her Facebook page “I have resigned already PT Parameshwara Naik, when will you,” directly targeting the minister, who allegedly transferred her thrice on flimsy grounds. It may be recalled here that Anupama Shenoy had put minister Parameshwara Naik’s call on hold in February which apparently had irked the minister. He allegedly pressurised the department and ensured that Anupama was transferred thrice. Although the Congress government received much flak for such a move, Anupama moved from station to station doing her duty as an upright officer. Anupama resigned on June 4 as she was upset over a protest by a liquor shop supporters against the detention of three persons, who wanted to extend their liquor shop. Extension of the liquor shop would have blocked the way leading to Ambedkar Bhavan. It is also said that her subordinates did not support when she stopped construction of liquor shop extension works in Kudligi. This also had upset Anupama forcing her to quit her office. However, Anupama has quoted “personal reasons” for her resignation. 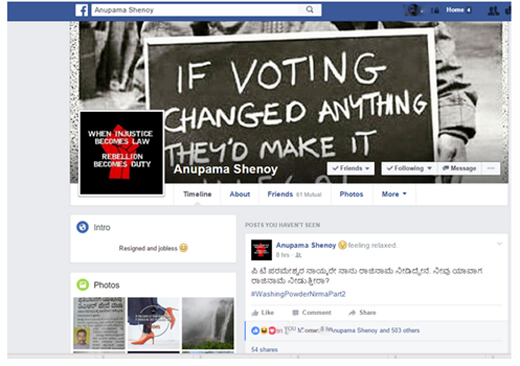 Since then on Anupama has taken on the government and police department through her posts on Facebook which clearly reflect injustice meted out to the officer. Something is wrong between the two people . A sudden decision to resignation ? The matter has to investigated and the justice has o be given. Any way Anupama is known for sincerity.